Typescript is a completely free open source content management system for use on a variety of websites. Built with not-for-profit organisations and personal websites in mind, you can use it to create and maintain anything from a simple family website to a larger, more complex site needed by community groups, churches, clubs and bands. We built Typescript for both developers and users alike. We’ve made it easy to create themes that allow for a great number of different designs; fluid or fixed width, with plenty of styling opportunities. The editor is powerful, with intelligent dialogs that pick up CSS styles that you’ve written, along with a graphical table editor and tools that facilitate standards compliant HTML creation. However, the program assumes no knowledge of CSS or HTML and so you can manage a website simply by using the WYSIWYG editor and one of the default themes. Three levels of user access; great for experienced administrators and novice users alike. Comprehensive page management system with add/remove/ordering of pages and sections. 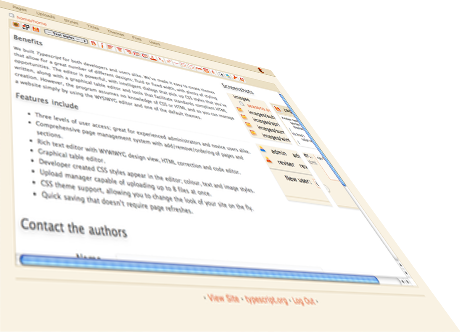 Rich text editor with WYWIWYG design view, HTML correction and code editor. 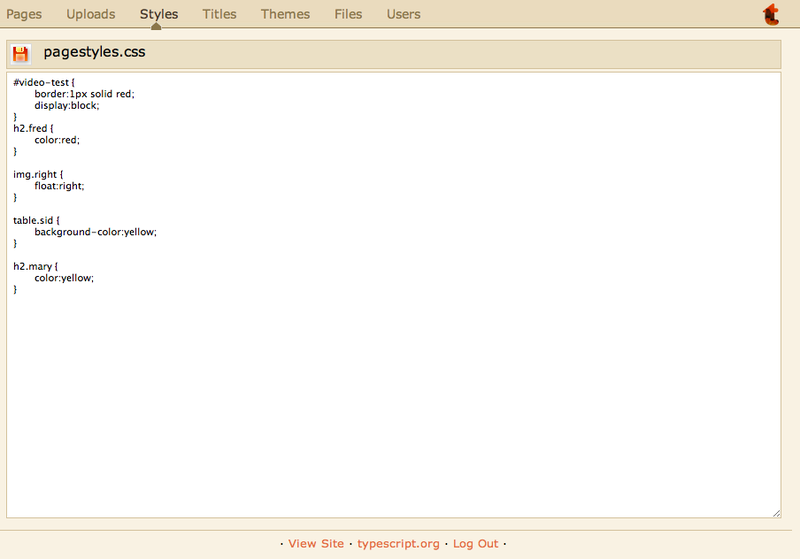 Developer created CSS styles appear in the editor; colour, text and image styles. Upload manager capable of uploading up to 8 files at once. CSS theme support, allowing you to change the look of your site on the fly. Quick saving that doesn’t require page refreshes. Built and maintained using Typescript 2.0.0. Copyright © Ben Briggs & Ray Middleton 2007-2010. All rights reserved.